I am a born and bred De Aar local. I have no intentions of leaving De Aar because I am a family man and this is where my family in based. 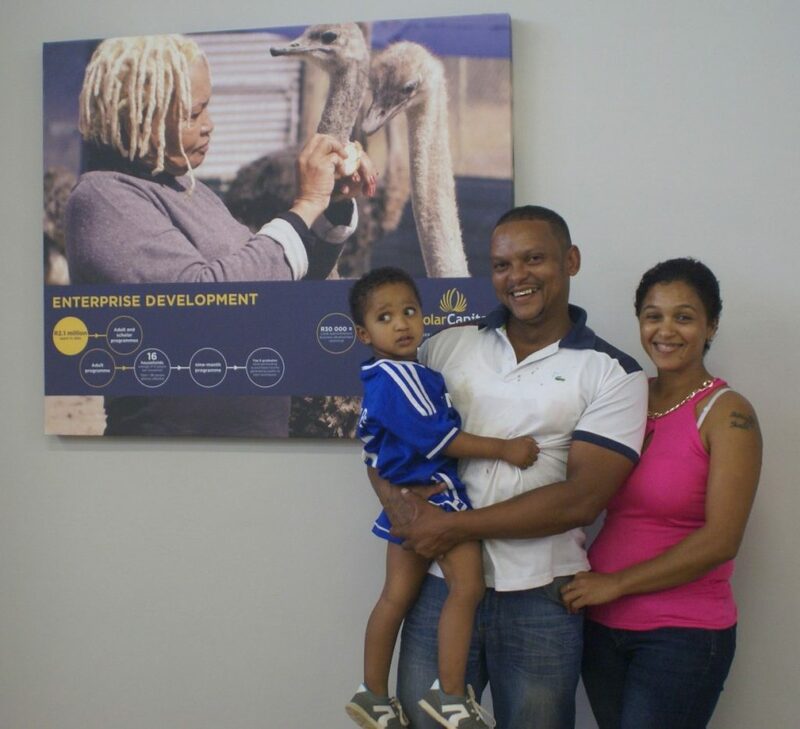 I live with my fiancé Fatima Roelofse and my son Ashley De Leeuw Jr, who keeps me very busy. After finishing my matric, I decided to study law at the University of the Free State but this did not work out as planned. I was always interested in computers and so then focused my studies on this and obtained a number of diplomas. I opened my own computer business a few years ago but I didn’t then have the knowledge of how to manage it and eventually we shut our doors. When I heard about this programme I thought that it would be an amazing opportunity to develop myself as a person and to acquire further business skills. During the Programme our aim was to set up our own businesses. After thinking about it for some time, I decided to open a printing company which I have called Griffelkie. When working in computers I saw the need for this in our area. My fiancé was working as a manager at Lewis Stores at the time, but we decided to join forces in order to make our dream a reality. I am the hands on guy in the business. I do the graphic design and Fatima does the sales and admin. Through the programme we learnt how to manage finances and general admin. We also looked at marketing, branding and advertising. This will really help our business move forward. We were able to purchase printers with the money given to us by Solar Capital. We can now print on canvas, paper and other materials and so make posters, banners, vinyl’s and more. As rent in town is quite expensive we have decided to work from home to start until we are established. Now I have completed the programme I see aspects of the business in a different way: in a positive way. This is mostly due to Prof Van Zyl who runs the programme. I want to give heartfelt thanks to Prof for making himself available for Griffelkie. We really need your skill level and experience on board. Without your expertise we would find it difficult to get Griffelkie off the ground. Your advice and guidance are truly appreciated. We know your door will be open for us every time we need you, and with you on board Griffelkie will become an unstoppable force. Also, thank you Solar Capital for allowing us to see that our dreams are possible. We will give our utmost to make this dream a success and become, like you, a beacon of hope.